First I add whatever veggies I have. Usually a choice of bell peppers, tomatoes, broccoli, onion or zucchini. 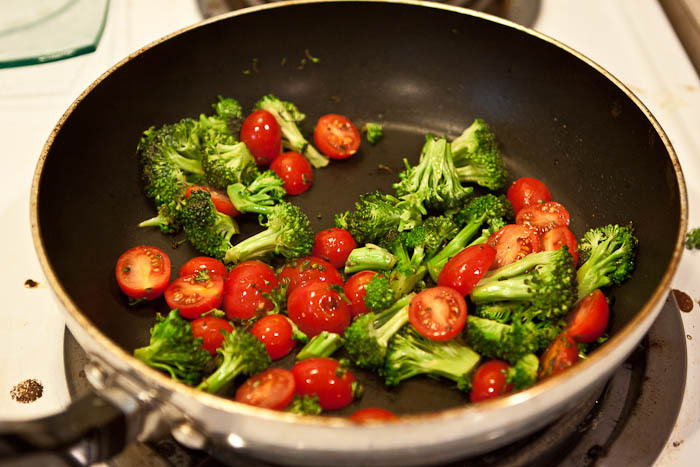 Today it was broccoli and tomatoes because I was tired of chopping stuff up. I spray it with the Smart Balance spray and saute. Season with some salt and pepper if you’d like. Once stuff is starting to soften up a bit, I added 2 servings of Kirkland Egg Whites and 1 whole egg. Then I took 1/3 of a cup (not packed) of shredded cheese and mixed it all together until the eggs were cooked. Top with 2 tbsp of salsa and enjoy! Some times if I’m eating this before going to the gym, I’ll scratch the cheese and put a wedge of Laughing Cow Lite on a piece of whole wheat toast and put the scramble on top of that. Today I was eating this after coming home from the gym along with some chocolate whey and water.